Roland ransomware is the virus that makes your data useless by changing the original code of the file. Those documents, photos or archives can only be opened after decryption which is not always possible. You should scan the system fully with reputable anti-malware tool and eliminate this virus instead. Roland ransomware is the virus that offers a 50% discount for victims who contact developers via merosa@india.com or merosa@firemail.cc in 72 hours. Roland ransomware is the cryptovirus that demands $980 for encrypted data in the ransom note file named _readme.txt. This file encryption based threat belong to STOP virus family. The particular .roland files virus is similar to previously discovered versions that hail from DJVU ransomware, which is mainly active right now. Various malware researchers like Michael Gillespie report about new releases every other day. Almost all versions in this family deliver the same ransom note file that includes a message with the payment demand and contact information. When Roland ransomware virus delivers _readme.txt, it demands victims to pay $980 for locked files. Although virus developers offer a half-off discount, you shouldn't even consider paying cybercriminals or contacting them at all. Especially, when there is a possibility to get some files decrypted, depending on the version. You should read more about decryption tools here. Victims of Roland ransomware get their files locked and marked with the .roland file extension, and this is the first and primary symptom that indicates ransomware attack. Unfortunately, file encryption is not the main nor the only sign of cryptovirus infection. 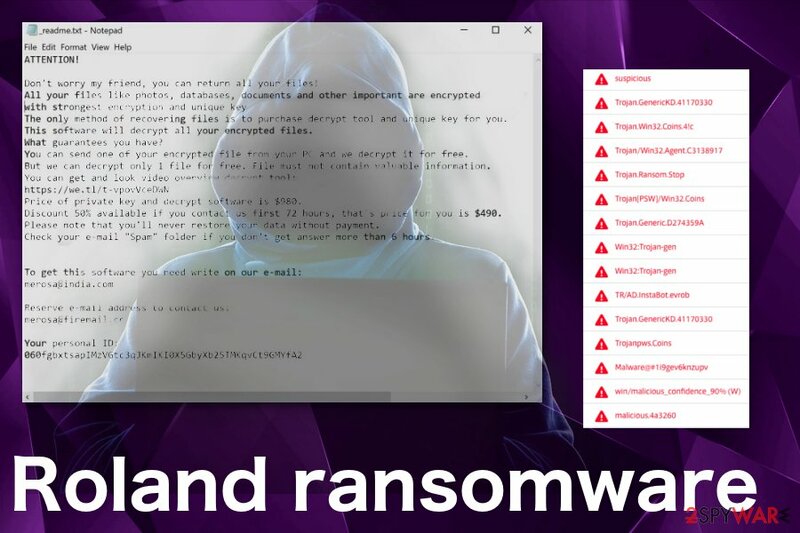 Roland ransomware developers made this threat as any other Djvu version, so the text file that appears on your Desktop and in every folder with encoded data deliver the same message as any previous version discovered in Spring 2019. Since March, this family released more than 20 variants. Check your e-mail “Spam” folder if you don't get answer more than 6 hours. Roland ransomware suggests to contact developers via merosa@india.com, merosa@firemail.cc emails, so the amount of ransom can be smaller than the initial demand. However, we do not recommend trusting these people since the alleged decryption might not even happen. Remove Roland ransomware instead, and then try to recover files with data restoring software or use your file backups to replace affected files with safe ones from the external device. You need a thorough system scan to remove this threat because it can alter some system functions or even add other programs. Roland ransomware is the cryptovirus that uses a strong encryption algorithm and makes users' files locked to have a reason for the ransom demand. Unfortunately, paying the demanded amount is not going to guarantee file recovery. We recommend using professional anti-malware tools for Roland ransomware removal and scan the device entirely. Then additional installs of malware can also get terminated. Use Reimage and check the machine for further changes or disabled programs and features. Base your selection of anti-malware tool on the detection rate. Roland ransomware can alter registry entries or add files to system folders, so security functions of the computer could be disabled. This fact makes virus removal difficult, so reboot your PC in Safe Mode before scanning with antivirus tool. Cryptovirus is one of the most dangerous malware out there that gets on the machine via executable files or documents filled with macro viruses. Experts always note about this type of cyber threats and the risk behind spam email. This is a common virus spreading technique used to proliferate trojans, other harmful malware, and ransom-demanding threats. when opened, document or PDF prompts additional content enabling pop-up. Once the file attachment is downloaded, opened and macros triggered the malicious payload, or direct ransomware script launches the malware and attack starts in the background without users' knowledge. Delete any suspicious email and clean the system using antivirus tools more frequent. Since Roland ransomware virus is one of the most dangerous cyber threats, contacting developers is not a good idea. Especially, when this threat belongs to a well-known ransomware family who is continuously developing new versions. For the Roland ransomware removal, you should get a reputable anti-malware tool and scan the system entirely. With professional tools like Reimage, Malwarebytes MalwarebytesCombo Cleaner, or Plumbytes Anti-MalwareMalwarebytes Malwarebytes you can eliminate all threats added by the initial virus or even fix some issues with your device. Make sure to remove Roland ransomware completely, scan the system again to double-check. This way you can be sure that the PC is malware-free and you can freely recover your files using your data backups. Log in to your infected account and start the browser. Download Reimage or other legitimate anti-spyware program. Update it before a full system scan and remove malicious files that belong to your ransomware and complete Roland removal. When a new window shows up, click Next and select your restore point that is prior the infiltration of Roland. After doing that, click Next. Once you restore your system to a previous date, download and scan your computer with Reimage and make sure that Roland removal is performed successfully. Guide which is presented above is supposed to help you remove Roland from your computer. To recover your encrypted files, we recommend using a detailed guide prepared by 2-spyware.com security experts. You can find all needed information about the decryption tool here. ^ Cryptovirology. Wikipedia. The free encyclopedia. ^ What happens when victims pay ransomware attackers?. Trendmicro. Simply security blog. ^ DD98.TMP.exe detection analysis. Virustotal. Online malware scanner. 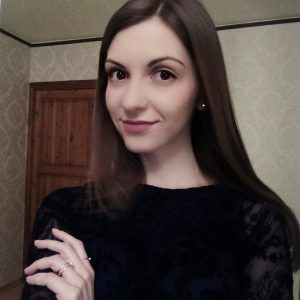 ^ Virusai. Virusai. Spyware related news. This entry was posted on 2019-04-08 at 04:01 and is filed under Ransomware, Viruses. You can quickly scan the QR code with your mobile device and have Roland ransomware manual removal instructions right in your pocket. How did you remove Roland virus?